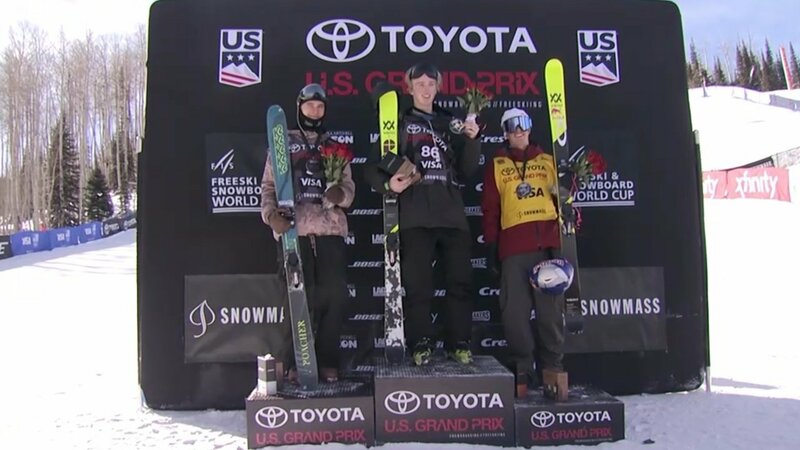 US Skiers McRae Williams, Willie Borm, Quinn Wolferman, and ladies Devin Logan and Maggie Voisin were out at Snowmass today fighting for a podium to improve their chances at making the US Olympic Team. I wish I could say that Slopestyle today was progressive but, for the most part, it was fairly mundane. Not too much stood out in the rail section (though Ferdinand Dahl did a dope 3 swap to switch on the DFD) but the guys were able to nail some crazy lines through the jumps which ultimately made the difference. McRae slid into third with his second run, but ended up being bumped to a 4th place finish before the end. While Willie and Quan were able to put down pretty solid runs, McRae was a clear leader for Team USA today. 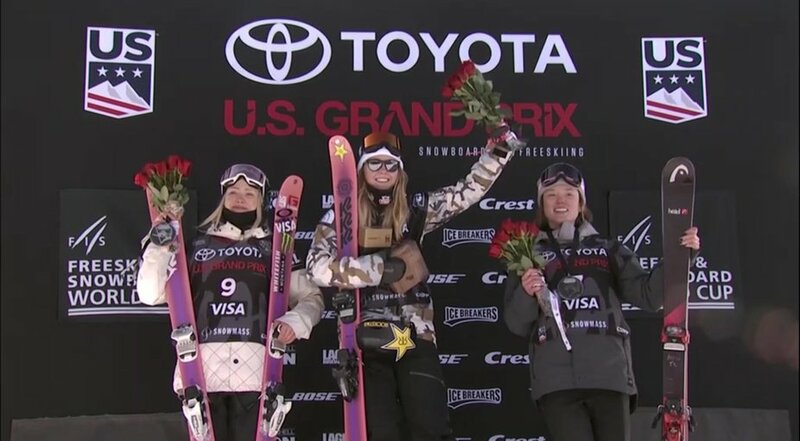 Unlike halfpipe yesterday, the results won't change too much with regards Olympic Qualifiers for the USA Slopestyle team, but regardless of podiums, each point they earn helps their chances. 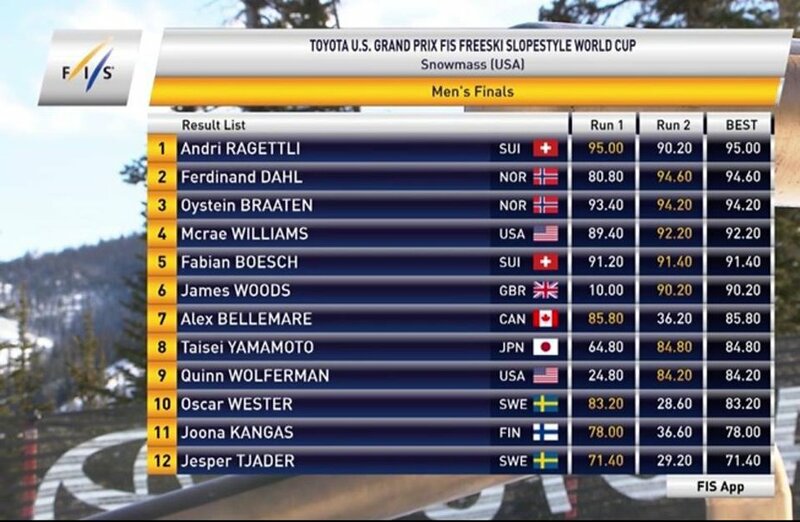 Andri Ragettli dropped last and his first run score, thanks to a left triple 14 to right dub 12 blunt combo, clinched his first place spot on the podium. The ladies were putting down mostly solid runs, but few were able to put down a solid run in the jib section. Maggie, who needed a podium to clinch her trip to the Olympics, put down a solid rail section and 9's on each of the three jumps, which earned her an 89.00 and put her in second place. Overall everyone threw down solid runs, especially in the jump section, bringing in a strong showing of unnatural spins. 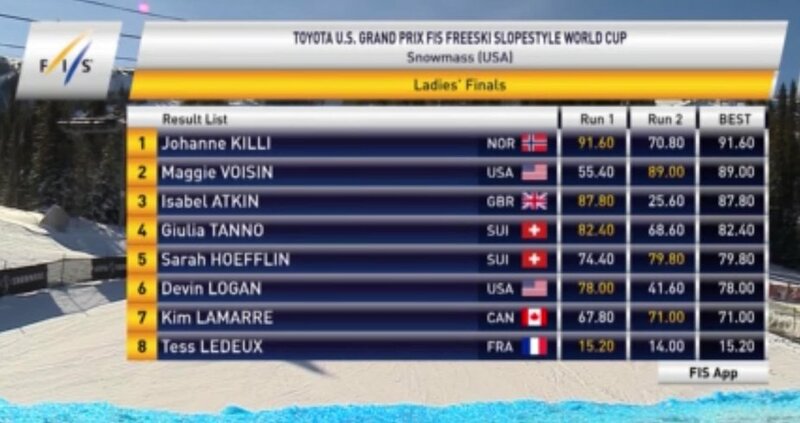 Johanne Killi fresh off a first-place finish at Dew Tour, laid down a solid first run and was able to victory lap her second with another gold podium.